This is my favourite Hungarian whip. The 6plait/two tone thong has a leather core and a nice decoration (like the handle). The "shield" on the handle has a wrist loop at its inner side. 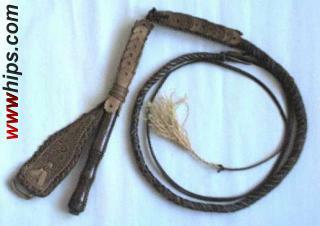 Typical for the Hungarian whip is the extremely long fall, which is nearly as long as the braided part. total length: 8ft.